V Care, as the name suggests, cares for patients suffering from one of the most traumatic illness – Cancer. V Care is a Mumbai based voluntary support group that reaches out to cancer patients and their family members to minimize the mental trauma they are likely to be going through. V Care’s trained volunteers visit cancer hospitals in Mumbai regularly to provide emotional as well as financial support to patients throughout the journey duration of the treatment. V Care engages patients in productive activities by offering training in various vocations. This is to empower them and revive a patient’s confidence and hope to fight cancer. Cancer survivors, particularly women who received training during their treatment are known to have started their own small businesses, thus improving their economic situation. Training sessions are conducted by V Care volunteers, called as ‘Resource People’. Education based programmes are conducted for children diagnosed with cancer at Sant Gadge Maharaj Dharamshala (Dadar). V Care also offers counselling to patients for palliative care. The organisation visits nearly 10-12 colleges/schools/corporate houses in a year, to create awareness on cancer and early detection of cancer. Many recreational outings are organized during the year to alleviate stress levels of a patient and their relatives. V Care has no treatment centre of their own. Cancer hospitals they visit are Tata Memorial Hospital, Jaslok Hospital, Lilavati Hospital, Nanavati Hospital, Breach Candy Hospital and St. Elizabeth Hospital. They also work closely with other Support Groups in different parts of the country, to ensure that their beneficiaries are provided with required care and support even after they migrate back to their respective home towns after the treatment. V Care’s credo is to provide free help, hope and awareness. The distinguishing factors for V Care are: Free services offered to all patients and lowest salary bills for staff/volunteers involved in executing the programme activities. These two factors place V Care a notch above the other NGOs helping cancer patients. Total Income: V Care’s total income for FY13 was Rs11.3mn, rose substantially by 47% from the income earned in FY12 (Rs7.7mn). The rise in total income is attributed to a sharp increase witnessed in donations received from individual donors throughout the year, followed by membership fees & interest income received. Individual Donors: Donations from individual sources outperformed donations received from other sources in FY13. Individual donations accounted for 56% of the total income earned in FY13. Amount raised from individual donors during FY13 was Rs6.3mn v/s Rs3.4mn in FY12, an approximate 1.8x Y-o-Y increase. The organisation has a very wide base of individual donors and has been transparent in sharing names in their quarterly newsletter. Interest & Investments: Interest earned from investments made in FY13 was Rs3.2mn, increased by 24% from the previous year. The rise in interest income was owing to 19% increase in investments made during FY13. Large portion (95%) of investments were made in fixed deposits. 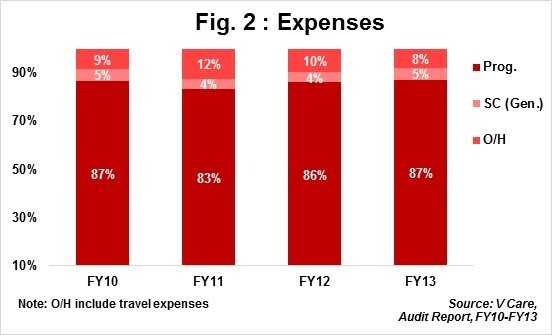 Programme Expenses: In FY13, V Care spent Rs6.3mn i.e. 87% of their total expenses on carrying out programme activities. V Care’s spend on programmes in past 4 years, has been on an average above 85% between FY10 and FY13. Programme expenses are spent exclusively for the beneficiaries. V Care does not pay any salary/stipend to its staff/volunteers directly involved in programme related actvities. V Care’s average spend (FY12 & FY13) on programme related actvities was 86%, whereas sector average for last two years has was around 60%. The impressive spend above 85% was possible, primarily because of its ‘No Salary - No Stipend’ model. Sector average includes NGOs offering similar services and are listed with us. General Staff Cost: This include salaries paid to full time admin staff and amount spent on staff welfare., V Care has spent less than 5% of total expenses on General Staff Cost in FY13, which is in line with the sector average of 4-5% for the same period. Fund Raising Cost: NGOs which care for cancer patients, are often found incurring huge cost on fund raising (15%-20% of total expenses each year). V Care has reported less than 1% spend to raise funds. Most of V Care’s funds are raised through internal contacts and word of mouth. Low fund raising cost gives V Care an edge over other NGOs and allows a larger proportion of spending on its beneficiaries. Trust Corpus & General Funds: V Care, has made conscious efforts over the years to build its trust corpus. Trust Corpus at the end of FY13 was Rs21.4mn, 17% increase from the previous year. General Funds stood at Rs26mn in FY13, rising marginally by 4% over the previous year. The increase in corpus and general funds, is owing to healthy Y-o-Y income growth. 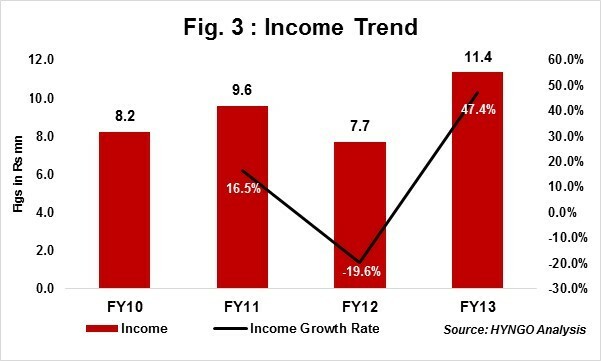 Income Growth Rate: V Care’s total income has grown at a conservative 4-Year CAGR of 11% between FY10 and FY13. However, Y-o-Y income growth rate for V Care has been erratic in past three years. Individual donors, has remained the major revenue contributor in past four years, thus fluctuations observed in donations received from individual donors has influnced the growth rate of total income. Y-o-Y income growth rate for sector in FY13 was around 40%, whereas V Care’s Y-o-Y growth rate in FY13 was 47%. 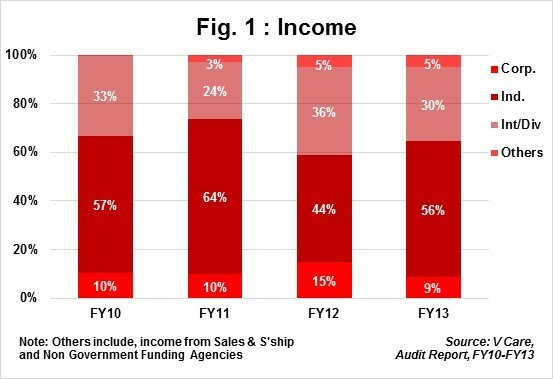 Self Sufficiency Ratio: V Care’s self sufficiency ratio improved significantly from 92% in FY12 to 137% in FY13, suggesting strong income flow from own income (own income include: individual donations, interest income, management fees, other income) and better management of expenses. Self sufficiency for other NGOs in the similar space stood at around 125% for the same period. Self Sufficiency Ratio, indicates an organisation’s ability to meet its expenses from its own funds. Ratio above 1 or 100% is considered to be good. Strong Network: V Care, over two decades has created value for themselves by serving cancer-afflicted patients in their own unique manner. The work done by V Care volunteers is appreciated by the donor fraternity and this is evident from the rising pool of donors, particularly individual donors supporting V Care programmes. The V Care team has made commendable efforts to reach out to donors, using their own network without rolling out any high-cost extravagant fund raising plan. Maintain relationships with beneficiaries: Majority of V Care’s beneficiaries are migrants from remote locations in India. Unfortunately, due to poor communication network, staying connected with patients to monitor their health and emotional condition is almost next to impossible for V Care, as they dwell in rural areas that are not easily accessible through phones. To address this challenge, V Care has collaborated with several ‘Local Support Groups’ in remote locations, however, the gap is not fully bridged yet, as many remain unattended post treatment. Sourcing Volunteers: Known for offering free services to cancer patients, V Care is grappling with inducting enthusiastic volunteers willing to serve patients, free of cost i.e. with no stipend nor professional fees for their time and services. V Care’s recent attempt to increase the portfolio of services that would uplift a patient’s morale and stimulate positivity, requires young and compassionate volunteers. These volunteers can bring in their skills or simply quality time to spend with inmates. Volunteers, wanting to sell their products or services to patients, are not entertained by V Care. Contribution towards Corpus: V Care’s immediate future plan is to build a trust corpus of minimum Rs40mn in the next two years. The interest generated from corpus, should be sufficient enough for V Care to take a shelter home on rent for patients from outside Mumbai. Despite the wide base of donors supporting V Care programmes, not many are coming forward to help V Care build its corpus. Vandana Gupta, herself a cancer survivor and Founding Trustee is a known for introducing ‘coping mechanisms’ for patients and their families to deal with cancer. She has inspired many cancer survivors to live a better quality life. V Care’s board consists of 11 trustees, out of which 4 are actively involved in the daily operations of the organisation. The trustees come with diverse backgrounds. The Board meets once every quarter and the core team meets once every month. Minutes of the meetings are recorded and stored in physical form at the head office. V Care doesn’t publish annual reports, but releases quarterly newsletters; which are detailed and shared with all their stakeholders – donors and beneficiaries. Newsletters not only include donor and beneficiary details, but also serves as an information tool, spreading awareness about cancer and mechanisms to cope with it. These are also printed in vernacular languages so that the message is communicated to all targeted potential beneficiaries. V Care is only registered with United Way Mumbai.